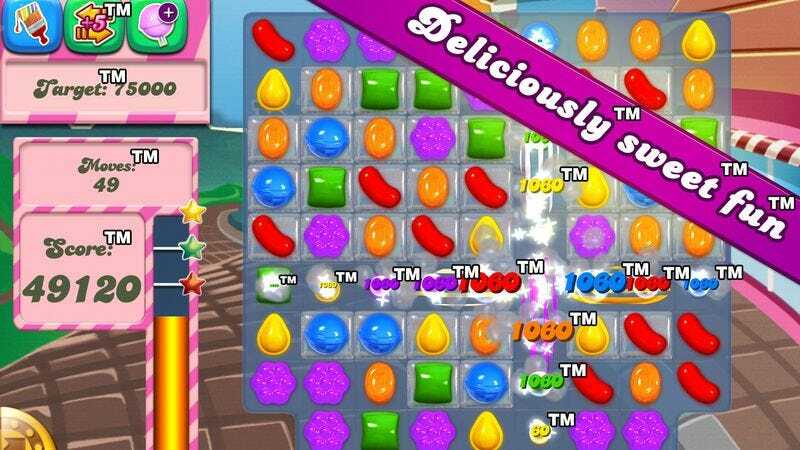 Earlier this week, it was reported that King, the studio behind the widely distributed dopamine-release app Candy Crush Saga, was attempting to secure trademark rights to the word “candy.” The news emerged after King sent letters (by way of Apple) asking developers on the iTunes App Store to pull down their candy-themed iPhone games. It turns out that King’s trademark crusade doesn’t end at “candy.” Yesterday, Internet sleuths dug up documents that King’s lawyers submitted to the U.S. Patent And Trademark Office late last year to block the registration of a trademark for Stoic Games’ The Banner Saga. Banner is a Kickstarter-funded game from a small developer that couldn’t be more unlike Candy Crush Saga unless it were something other than a video game, like a vacuum cleaner, maybe. King’s complaint stems from Stoic’s use of the word “saga,” which King attempted to trademark for use in the video game sector in November 2011, in addition to the company’s 15 separately trademarked game titles that end in the word “saga.” In the complaint, King’s lawyers write that The Banner Saga is “confusingly and deceptively similar” to the company’s own trademarks. The Banner Saga makers and other small-fry game developers weren’t King’s first targets. Before a published trademark is finally registered and enforceable, there’s a 30-day period during which other parties can either challenge it (which is what King did to The Banner Saga) or ask for an extension of the 30-day period so they can build an opposition case. The prolific, anonymous video game snooper known as Superannuation pointed out that King’s lawyers have been asking the trademark office for extensions on the opposition periods of a number of “candy”- and “saga”-related applications. As Superannuation notes, this doesn’t mean King will step in and oppose the trademark application, but an extension can act as a sort of passive-aggressive threat. For example, Superannuation pointed to documents showing that Konami terminated its proposed “Animal Saga” trademark after King’s lawyers filed an extension against them. As many observers pointed out in the wake of King’s attempt to claim “candy,” plenty of games, such as the classic board game Candy Land, existed with “candy” in their titles and were trademarked before anyone at King thought to make a confection-themed Bejeweled clone. The same could be said for “saga.” Square Enix, for example, currently holds three trademarks for titles including the word “saga” that predate anything saga-related from King: SaGa Frontier, Unlimited Saga, and Romancing Saga. Ars Technica’s Kyle Orland received word from a King spokesperson that the company’s defense of its not-yet-and-probably-won’t-ever-be-finalized “candy” trademark is based on its officially registered trademark of the word in the European Union. King holds many registered trademarks in the E.U., including, yes, the word “candy,” but it hasn’t been as lucky stateside. In a bit of karmic justice, King’s effort to register a trademark for the title Candy Crush Saga has been stalled on multiple occasions by Saga Furs, a European company that produces, designs, and sells high fashion furs, which has held the trademark on “saga” in the clothing industry since 1978. This probably wouldn’t present a problem to most video game companies, but King wanted its Candy Crush Saga trademark to apply to everything from games to fire extinguishers to ski gloves. Not to worry, though. It seems King has made amends with Saga Furs and added a little disclaimer to its long list of clothing items covered by the proposed Candy Crush Saga trademark—“the aforementioned goods specifically excluding goods made from furs, animal skins, hides, leather or imitations of these materials.” King sees no need to participate in the fur industry, as it prefers to keep its prey alive. More lucrative that way.